Couple of interesting charts on Greece. First up: what are the options? 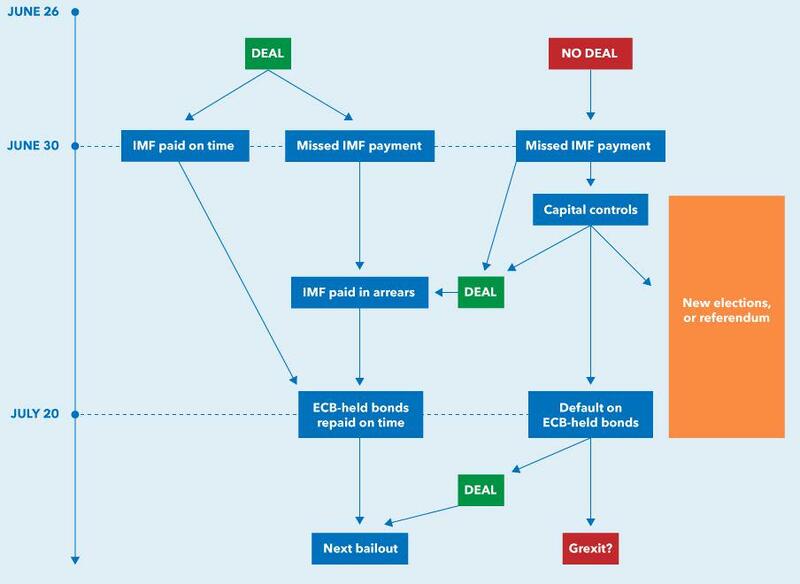 Interestingly Greece already has capital controls, but yet to miss (officially) and IMF payment. Now, even if there is a deal, Greece will still have to go into the arrears on IMF, unless they found that proverbial granny's couch from which they can squirrel away few bob (EUR1.6 billion that is). We also have an already scheduled referendum. Which, according to the chart is a dead-end. Which it is, because its outcome is either rejecting a non-valid deal or accepting a non-valid deal. Though, presumably, the non-valid deal can be revalidated by the Troika (Institutions) in a jiffy. In short, the chart above doesn't help much. 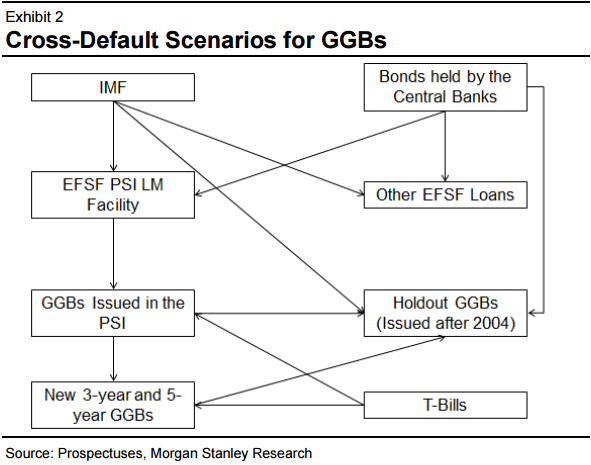 Non-payment to IMF can trigger (though does not have to) default on EFSF and holdout private sector bonds (pre 2004). Default on T-bills (short term bonds) triggers privately held bonds excluding holdouts and new bonds. Everything else is fairly simple. Now, per table above, we are in the 'Publicly Acknowledged' blue-shaded area (any delay on payment will be known at this stage and avoiding a public declaration will be hard, if not impossible, especially given political stalemate). 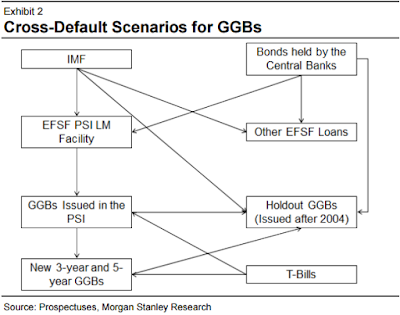 Non-payment to IMF triggers default on EFSF, and likely to trigger default on bilateral EU loans. Non-payment of EFSF loans triggers nothing with any certainty. The worst contagion is from PSI bonds default. Special note to CDS triggers: basically, bigger risks are from SMP (ECB) bonds, PSI (private) bonds, and post-PSI (private) bonds. EU loans and holdouts from PSI bonds are dodos.